Iconia is netbook-type product running Windows 7, with a second screen where you'd normally expect a keyboard (like a larger version of Toshiba's Libretto). If you put both hands on top of the display, a virtual keyboard automatically appears, anticipating your needs. There are gesture controls, as well, for easy interaction with the system. The bottom screen is for media management, while the top screen displays An SDK will be available by the end of December. There will also be a 10-inch Windows 7 tablet, complete with a keyboard attachment. They're anticipating a release of the 10-inch tablet in February—but keep in mind that we're early enough in this process that none of the tablets (Iconia aside) even have names yet. Acer's 10-inch Android tablet is the star of the show—powered by Tegra 2, making it a graphical powerhouse right off the bat, including full 1080p video. It'll run Honeycomb, as will its 7-inch little brother. The phone's got a 1.3MP front camera, 8MP rear camera, and can take 720p video, although no word yet on guts. As for availability, looks like it's up to Google: Acer doesn't want to release a tablet with a phone OS, so they're holding out for Android 3.0. Acer's pushing unified devices with what they're calling clear.fi. Basically, when you download content it'll be available on all clear.fi devices. It's a way to stream media across over Wi-Fi—it automatically discovers connected devices, and uses a simple drag and drop interface to spread your media around. Sources go on the left, media in the middle, and destination devices on the right. Sounds simple enough! You'll need an Acer device from 2009 or more recent for clear.fi compatability. Acer's "next-generation store" is called Alive. But how is it different from any other app store? Acer says it's "real-time." Each piece of content is a feed, and is displayed to you real time. Curious to see what that means in action. It's also global as well as local, which is to say it will target regional offerings and partner with local content providers. It's a cloud-based store—meaning that losing your device doesn't mean you've lost your content—and all purchases are one-click. The My Channels feature filters content by specific interests, similar to a TV channel—the content provider can group a type of content, any type of content, by gender, or any kind of interest. Similarly, Alive Recommends suggests things they think you'll like based on what's already in your user library. As for content, it'll be off to a solid start: a song library 8 million strong, with thousands of movies and a healthy supply of books available at launch. Which, by the way, is December 20th in the UK and Italy for Windows 7 devices only, followed by a US, Europe, and Asia launch next spring. 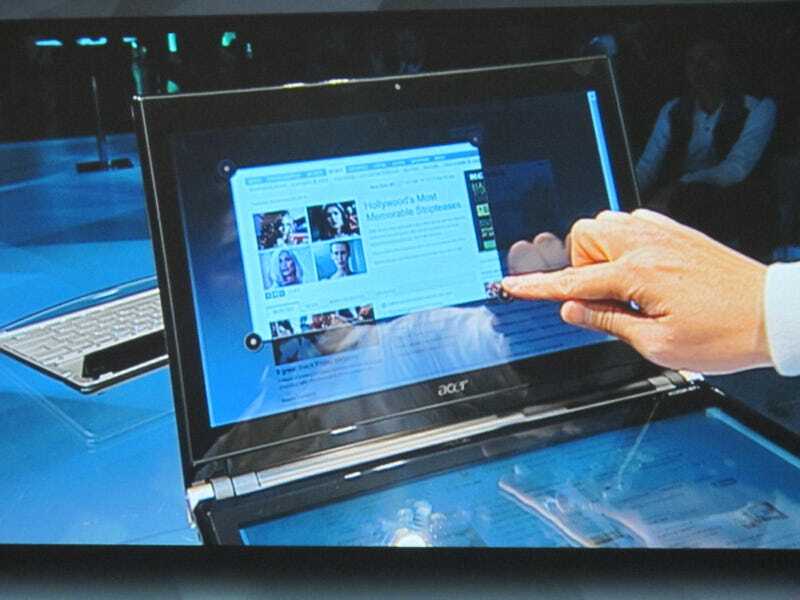 And despite the Windows 7 exclusive start, Acer plans for Alive to be platform-neutral by Q1 of next year. Any Acer device can access Alive, although obviously HD content will be of limited use to older phones.